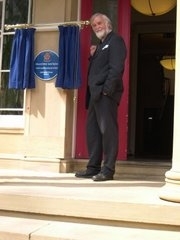 Denis Judd unveils the new Blue Plaque at Ashburne Hall. Ashburne Hall, originally Ashburne House, was first located in Victoria Park. It moved to its present location in Fallowfield in 1908 after Edward Behrens and his wife Abigail, whose ghost is said to remain in Hall watching over the students, donated their 1827 Cotton Merchant’s house for the continuing education of women. 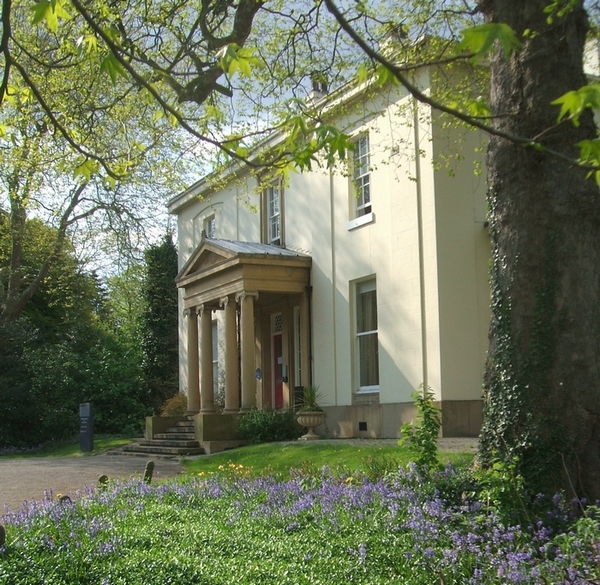 Once known as ‘The Oaks’, this grade 2 listed turn of the century house is now simply known as Behrens House. The first hall for women at The University of Manchester (then Owens College), Ashburne Hall, a listed building as well, has grown considerably from its original conception as an ‘experiment’. The first wing to be completed on the current site was Mary Worthington in 1910. It stood by itself until 1924 when the Centre Block, which contains the Dining Hall and the Library, and Ward Wing were completed. After the war, in 1933, Lees Wing was finally built, replacing what has come to be know as the ‘Tin Tunnel’, a drafty makeshift hallway made of tin that connected Behrens to the rest of the buildings. It was always the vision that Ashburne would take the design of a quadrangle. This vision was finally realised in 1994 when Sheavyn House, the detached, self-catering, en-suite wing of Ashburne was completed. Sheavyn, which was named after Ashburne’s third Warden, Dr. Phoebe Sheavyn, housed the first males of the Hall. In 2000 it was decided that Ward Wing should go mixed and be dedicated to postgraduate men and women from all over the world. From 2009 some male undergraduates were also welcomed to Ward Wing. Mary Worthington and Lees still remain all female. Information courtesy of the University of Manchester. 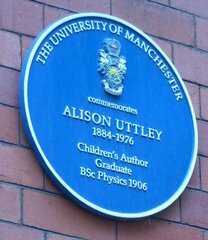 Blue Plaque Presented by The University of Manchester. 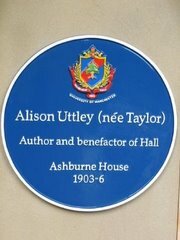 Blue Plaque Presented by The Ashburne Association, Ashburne Hall, Manchester. 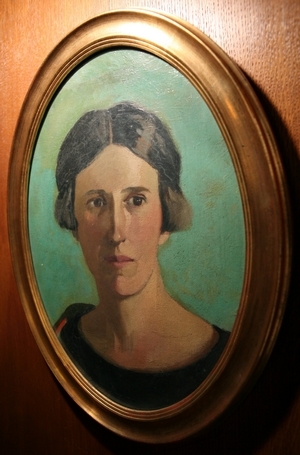 Portrait of Alison c. 1911, bequeathed by her to Peter du Sautoy and given by him to the University of Manchester. Behrens House, where Alison attended Ashburne reunions.